For nearly a century, our dedication to perfection has served as the corner-stone of our business. We are a family owned and operated business, dedicated to establishing long-term relationships with our clients. Frank G. Ferrara, an Italian immigrant, came to the United States and settled in Reading, PA in 1922. Eleven years later, he founded what today is known as Frank Ferrara & Son, Inc. The Observation Tower atop Mt. Penn on Skyline Drive, known also as the Fire Tower, was built by stone masons Frank Ferrara, Joseph Ferrara, James Ciliberti. A year later, retaining walls were built along Duryea Drive and at the Reading Airport. After WW II, Frank Ferrara was awarded a contract for the masonry work at the Hopewell Dam, using stone from St. Peter's quarry. The work was performed by the United States army engineers under the supervision of Colonel Low. Over the next few years, Ferrara built many prestigious homes throughout the greater Berks County and surrounding counties. Building stone was obtained from various areas including Bally, Oley (Homer Weller), Reading Quarry (Berks Products), Atglen Stone (Atglen PA), Adamstown (Al Consoli) and the Lachina Brothers. In 1954, Ferrara incorporated the business. His son Harry G. Ferrara served as president of the corporation. 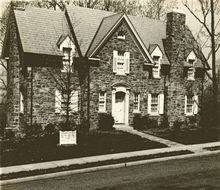 Frank and Harry continued to build quality homes and businesses, many located in the Wyomissing area. In 1999, Harry G. Ferrara passed the torch to his son, the third generation Frank G. Ferrara, who now proudly carries on the tradition of the company. Frank was delighted to have his son, Todd Weidenhammer, join the firm in 1997 and served as Controller and Project Manager. Todd brought new life to the business and, while making great strides in the field, sadly passed away in 2005. Today, Frank continues overseeing the day-to-day operations surrounded by a very capable staff including his youngest son, Frank G. Ferrara III.